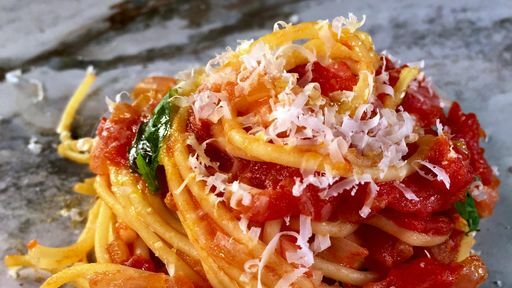 A classic from Michael Symon! Place a medium saute pan over medium heat and add olive oil. Add the onions, garlic, season with salt, and stir occasionally until the vegetables soften, about 8-10 minutes. Add the chili flakes and tomatoes, and season with salt and pepper. Tie the oregano with butcher’s twine and add it to the sauce. Reduce to a simmer and cook on low heat for 30 minutes. Meanwhile, bring a large pot of salted water to a boil. Add the spaghetti and cook 2 minutes less than package instructions. Remove the herb bundle from the sauce. Drain pasta and place in sauce. Toss pasta in sauce to coat using 1/4 cup to 1/2 cup reserved pasta water. Add butter, basil leaves and a drizzle of olive oil. Toss pasta until fully coated and glossy. Serve with freshly grated parmesan and a drizzle of olive oil. Tip: Have fresh tomatoes? Blanch them and peel them as a delicious substitute for canned tomatoes!